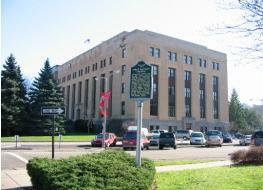 The 8th District Court Probation Department is located at the Michigan Avenue Courthouse. Prior to sentencing, Judges often order defendants to undergo screening and evaluation to assist them in determining appropriate sanctions (i.e. rehabilitation programs, jail time). Probation Officers interview the defendants, evaluate the case, and make recommendations to the Judges. With this information, the Judges can custom-design conditions that will provide the best opportunity for the Court to impact the defendant in a positive way, while simultaneously imposing punitive sanctions for the crimes committed. At the sentence hearing, the Judge will typically impose fines, costs, and fees, as well as, victim restitution. In addition to monetary sanctions, the Judge may order the defendant to comply with specific conditions and prohibitions in lieu of jail time. In many cases, a term of probation will be ordered to monitor compliance with the conditions. After sentencing, Probation Officers supervise defendants to assure compliance with the conditions imposed by the Judges. Conditions of probation typically include regular visits to report to Probation Officers; payment of all fees; participation in rehabilitative programs; psychological counseling; drug/alcohol testing; continuing or obtaining employment; and measures to protect victims. Throughout the period of probation, Probation Officers monitor compliance with the conditions of probation. Failure to comply or failure to report to a Probation Officer results in a hearing wherein the Judge will impose appropriate sanctions for violating the order of the Court, which may include revocation of probation and/or jail time.